That’s a great question. We lock our doors at night to keep our loved ones and possessions safe inside… or so we think. Locks alone can’t truly keep us safe because anyone who knows what they are doing can pick a lock and get inside. As a result, locks only create an illusion of safety. But just as locks can’t keep knowledgeable thieves out, they shouldn’t be able to keep you out either. Perhaps you return home from work one afternoon only to discover you’ve lost your house key. It’s late and your door is locked. Knowing how to pick a lock would save time and prevent you from having to pay a locksmith to break into your house for you. Why Should You Know How To Pick A Lock? Many people mistakenly believe that the only individuals who can pick locks legally are licensed locksmiths or law enforcement officers responding to a situation. But the reality is that in the overwhelming majority of states, as long as you are not trying to enter someone’s home illegally, it is perfectly legal to have and use lock picking tools. 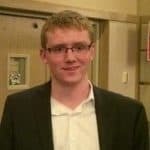 It should be noted that the information in this article is not to be used for committing a crime, but rather for cases when you forget or lose your own house keys and you need to get inside quickly. 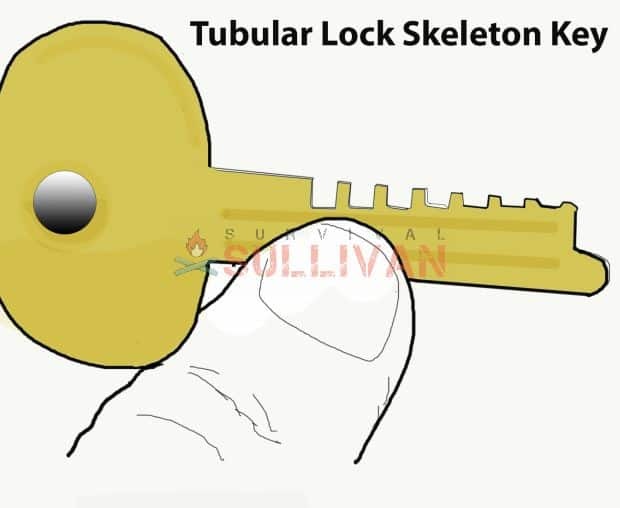 Knowing how to pick locks for grid down or survival situations could also come in handy. Before we get into how to pick locks, it’s important to understand how locks work so we’re all on the same page. A majority of locks consist of two separate components: the barrel and the pins. The barrel refers to the chamber the key is inserted into. The pins are small cylinders that sink into the barrel and hold it in place until a key pushes them away. When the pins are cut in half and the halfway mark lines up with the barrel, you can turn the lock and open the door. As a lock picker, your goal is to open the lock without the aid of the key that was made for it. 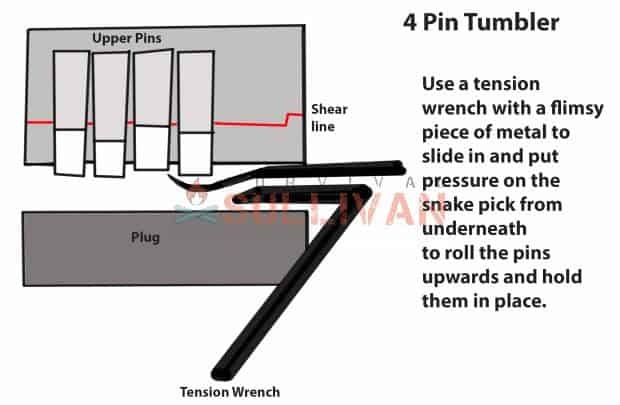 Therefore, you have to push up each of the pins manually into the right position, and then slowly turn the barrel so the pins don’t fall back into place. Once all of the pins have been moved out of the way, the barrel will turn and the door or safe opens. This may sound like an intimidating process, but bear in mind that all a key is to begin with is a complicated pick where the groves have been tuned so that all of the pins are aligned with it. By not using a key, all you have to do instead is find and then push each of the pins manually yourself. In this article, is related to our previous article on getting out of restraints, we’ll cover how you can pick a lock with a variety of different household items. We’ll then suggest some lock picking tool sets that you can consider purchasing which make using household items unnecessary. A bobby pin is a small, sprung hairpin that can double as a lock pick. To do so, you’ll need at least two bobby pins. If they have any rubber knobs at the ends (as most bobby pins do), remove them so that they don’t get in the way. Begin by pulling apart your first bobby pin until it is one long piece resembling a metal wire. This will serve as your pick that moves the pins out of the way in the locks. Next, you’ll want to use the lock to bend the tip of your bobby pin into a pick. You can do this by sticking roughly a centimeter of the pin into the lock, with the flat side of the pin facing upwards. Then push the pin left by two or three inches to bend the end slightly. From now on, we’ll refer to your first bobby pin as the pick. 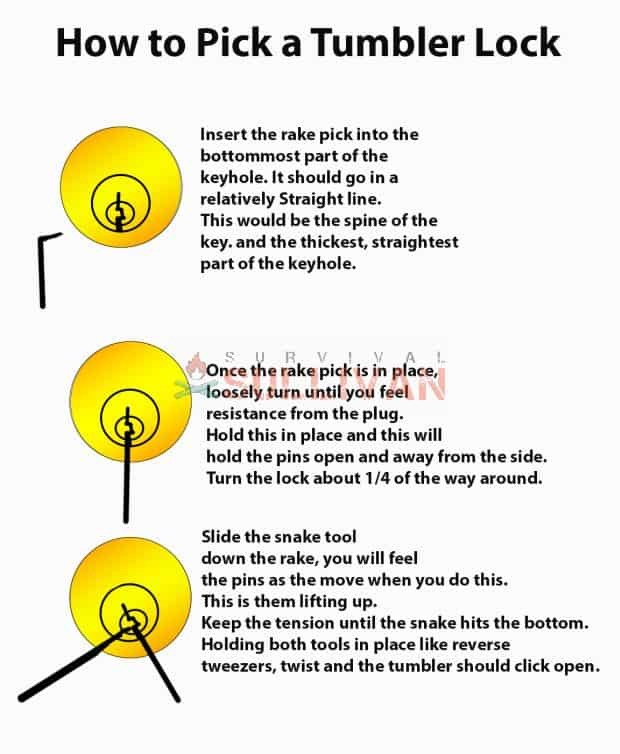 After that, you’ll want to turn one end of your pick into a handle. You can do this by taking the longer end and then bending it back on itself to make a loop. This way you’ll be able to exert more pressure on the lock when picking it. Now take your second bobby pin, and bend the whole pin into a right angle. You can do this with either your fingers or pliers. This second bobby pin will be what turns the lock after your first pin has moved the pins. From now on, your second bobby pin will be referred to as the lever. Insert the bent end of the lever into the bottom half of your lock. Get it as deep and as low into the barrel of the lock as you can. Turn the lock in the direction that you would to open it normally with a key. 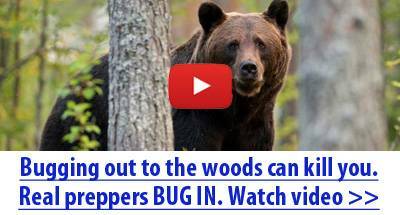 If you hear clicking or grinding sounds, you are turning in the WRONG direction. Don’t expect the lock to move very far, and don’t push so hard that you’re straining and exhausting your fingers, but you have to apply pressure throughout this process for it to work. While still applying pressure on the bottom half with your lever, insert the pick into the top half and feel around for the pins. All of them will be on the top half of the barrel, so the bent end of your pick should be pointed upwards. If some of the picks don’t feel like they want to move, don’t panic. Your goal is to count and locate each of the pins. Now test out which pins feel like they want to move and which ones don’t. If any are not moving, you should lessen the amount of pressure you’re putting on the lock with your lever. Find a pin that doesn’t feel like it wants to move, and push it up until you hear a click. Remember to keep pressure on the lock with your lever, but lessen that pressure by a little if a pin isn’t moving. Once you hear the click, it means that the pin is out of the lock’s way. Note: If you reduce pressure too much, the pins will fall back into place and you’ll have to start over. This is one of the most frustrating aspects for beginners using bobby pins, but don’t feel angry if you fail the first few times. Eventually you’ll get a feel for the lock. The more pins you push out of the way, the easier the lock will turn from pressure by the lever because with fewer pins in place there is less resistance. In addition, the more pins you press out of the way, the less resistant the other pins will become. Repeat this process with the rest of the pins. Eventually, once all of the pins have been pressed out of the way, you can then turn the lock and open the door. Paper clips are everywhere: offices, schools, kitchens, suitcases, messenger bags, backpacks, our pockets, lying around on the street or floor, you name it. Literally every home in America has at least a few paper clips in it. In other words, if you’re unable to accumulate a couple of bobby pins to pick a lock, find a couple paper clips to do the job. We sometimes associate paper clips with lock picking as well. We’ve all seen at least one movie or TV show where a character secretly breaks into a building by picking the lock with paper clips (but remember, the information in this article is not to be used for criminal purposes). 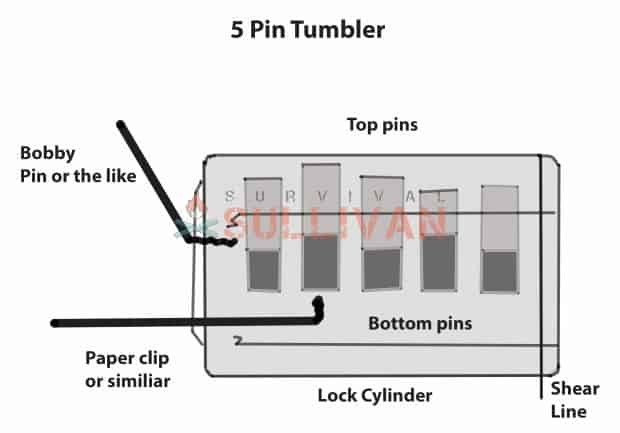 The principles of lock picking with paper clips are largely the same as they are with bobby pins. You’ll need at least two paper clips to complete the process. Take your first paper clip and lengthen part of it out into a straight line. This can be done with either pliers or your fingers. You’ll want to keep at least part of the clip the way it was so you can get a firmer grasp on it. Now take your second paper clip and straighten it out completely. Then, turn it around in the middle until the two ends meet each other at a roughly equal length. Go back to the now rounded middle of the paper clip, and bend it down just a couple centimeters. Find out which way your lock turns (remember if you start to turn it and you hear a grinding noise, you’re turning it in the wrong direction). Now insert your bent paper clip into the bottom half of the lock. Apply pressure in the direction that the lock turns. Just like with our bobby pins example, it’s important that you apply pressure on the lock the entire time. If you don’t, the lock will not turn. Straighten the paper clip and insert it into the top half of the lock. Push it as far back into the lock as it will go, and locate all of the pins that are inside the lock. Lift the straightened paper clip up until you hear pins clicking. If any pins are not willing to move, slightly reduce the amount of pressure you are applying with your second paper clip. But if you take away too much pressure, the pins that have already been pushed up may come back down, forcing you to start over. From then on, just keep working each of the pins until they all push up. Once they do, the lock will turn and you can open the door. Yes, it really is possible to open a spring bolt lock with the credit card you carry in your wallet every day. It doesn’t work with a deadbolt, but since spring bolt locks are the kind that are features on most doorknobs, learning how to pick a lock with a credit card may come in handy. Check your lock to confirm that it is a spring bolt lock and not on a dead bolt. Next, choose the card that you plan on opening the lock with. While laminated cards almost always work best because they are more flexible, it is advised that you select your least valuable card for this process. For example, you will want to use a membership card before you try your more valuable credit or debit cards. Wedge your selected card in the vertical crack between the frame in the area where the latch to the doorknob is. Next, bend your card in the opposite way from the door knob. This will allow the card to slip under the angled part of the bolt, and force it back into the door. In terms of posturing, lean against the door to help it pop open. Push and wiggle the card, and consider doing the same with the door as you work your credit card. If this isn’t working and you’re desperate to get inside, cut a notch into the back side of your card and then fit the V around the latch until it will pull down. The slide should eventually latch back and the door will then open. 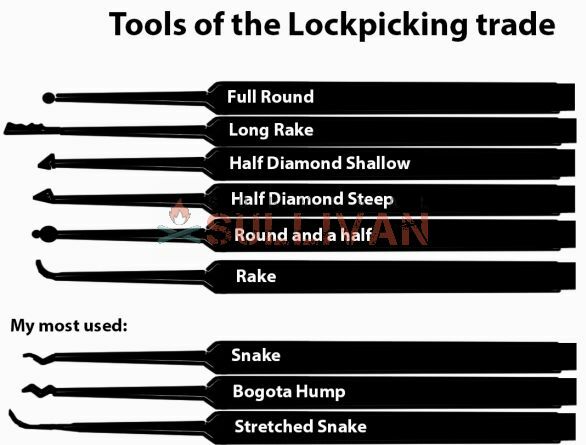 The above methods all work for picking locks if done correctly, but you can significantly ease frustration with the aid of a lock picking set. Remember, it is perfectly legal to own and carry a lock picking set in almost all states. They are also legal to use as long as you aren’t trying to illegally gain entry into someone else’s home or property. You can try out this lock pick set. Each set includes a free instructional e-book and a transparent padlock for you to practice with so you can see what you’re doing. If there is one final piece of advice that can be given to you, it’s that you must practice extensively. You don’t want your first time picking a lock to be when you desperately need to get inside whatever it is the lock is keeping you out of. Perfecting your lock picking skills will require much time, effort, and patience on your part, but once you get the hang of it and do it enough times it will become second nature. The practice will pay off the next time you are locked out of your home or safe because opening the lock will be significantly easier and less frustrating.